Join the SMW Lagos conversation on digital disruptions in the digital age sponsored by Microsoft. 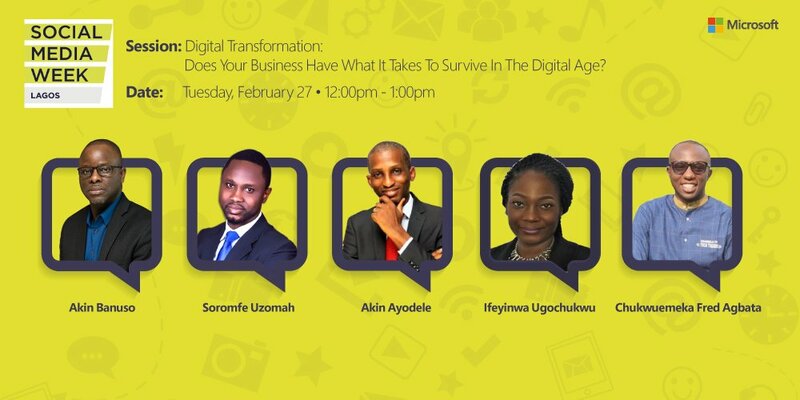 Microsoft’s 4Afrika and Nigeria teams will be hosting a Digital transformation session at SMW Lagos 2018 (Social Media Week Lagos). Social Media Week takes place February 26th to March 2nd 2018, an event promoting new media and technology. The panel will feature discussions on 4Afrika’s partnership with Tony Elumelu Foundation and using Digital Transformation to create opportunities for entrepreneurs. It’ll also see Microsoft Nigeria general manger, Akin Banuso and 4Afrika business development manager, Soromfe Uzomah discuss Digital Transformation. How Digital technology is changing industries, from manufacturing to health, retail, banking, agriculture and education. There will be other sessions featuring speakers from Microsoft on various topics in relation to technology and its disruption. Digital technology is changing every industry we know, from manufacturing to health, retail, banking, agriculture and education. For African entrepreneurs, this provides exciting opportunities for innovation and new business models. But where do the best opportunities exist? What are investors most attracted to? And what skills and tools do you need to run a successful modern business? This panel discussion will bring together experts from the technology, business and startup industry to explore how entrepreneurs can make technology work for them, saving time and money, and enabling them to compete in a digitally transforming business ecosystem. It further aims to address what skills entrepreneurs need to build a modern business that attracts investment. Follow us via our social media channels @Microsoftcaregh for #SMWLagos conversations update.